City of Trees is a deeply personal story about the struggle for good jobs and environmental justice in our cities. Since 1990, nonprofit Washington Parks & People has tried to reduce poverty and violence in Washington, D.C. neighborhoods by improving parks. At the height of the recession, the organization received a stimulus grant to create a "green" job-training program in communities hardest hit. They had two years to help unemployed people find jobs and improve parks in their neighborhoods. What sounds like a simple goal -- putting people back to work by planting trees -- becomes complicated by local racial tensions, a community’s distrust of outsiders, and a fast-approaching deadline before the grant money runs out. 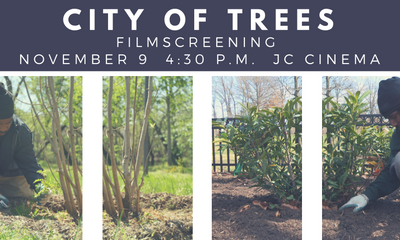 Filmed in an unflinching and compelling verité approach over more than two years, City of Trees thrusts viewers into the inspiring but messy world of job training and the paradoxes changemakers face in urban communities every day. City of Trees was featured at the 2016 DC Environmental Film Festival. Lance Kramer won Best Director at the 2016 IndieCapitol Awards. Recommended reading on hidden colonialism in documentary written by City of Trees editor Edwin Martinez. Brandon Kramer and Lance Kramer: "What Authentic Storytelling Means to Us"
See Lance Kramer interview for GMU's Studio A (2014). See film's website here. And see the trailer here. Huffington Post: "How Planting Trees Helped This Ex-Offender Turn His Life Around"
In These Times: "'City of Trees’ Provides a Look Into the Promise of Urban Green Jobs Programs"
WAMU 88.5: "In D.C. Neighborhoods, Rebuilding The Environment - And Residents' Lives"
Our discussion will be facilitated by Rutledge Dennis, Professor of Sociology and Anthropology at George Mason University. Presented by Film and Media Studies, Film and Video Studies, Mason Reads, University Libraries, Honors College, Off Campus Student Programs and Services, Center for Climate Change Communication, African and African American Studies, English Department, BSA, DKA, and University Life.